• Play had to be stopped after Police moved in to several areas of the ground after disturbances. • Over 20 arrests are made. Celtic fans had arrived in the town centre all day and had been drinking heavily. 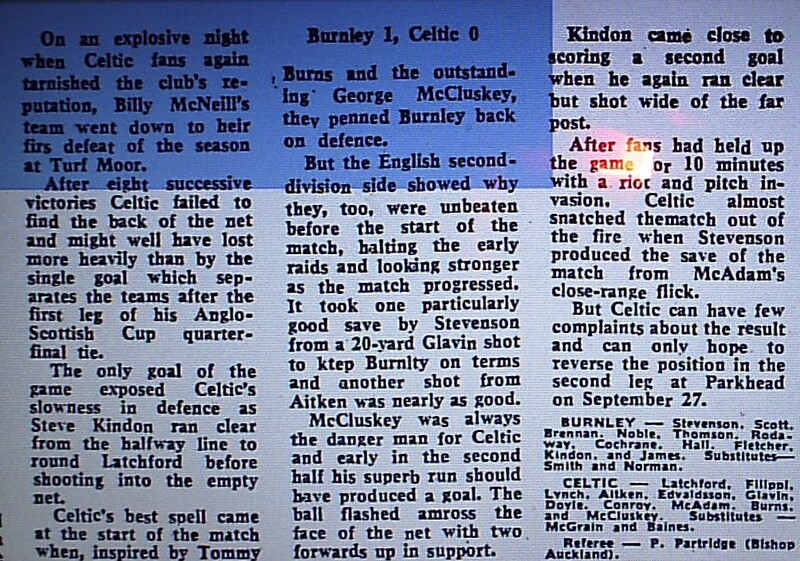 When the game began the Burnley fans had taunted the Celtic fans with chants of 'Rangers' and 'Argentina'. After this Celtic fans threw cans and bottles and invaded the 'no mans land' piece of terracing separating the rival fans. Only the appearance of Police dogs managed to force them back into their own section. Celtic fans tore up six foot iron railings and used them as missiles. Superintendent Henderson of Lancashire police said it was the worst hooliganism he had experienced and that 60 people were injured including several police. Referee, Pat Partridge had to withdraw the players for a period until order was restored. 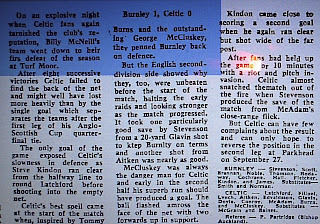 Billy McNeill and the Celtic players appealed to the fans for calm.